Bill Jackson’s can get you certified to scuba dive in just four to five weeks, depending on the course schedule you choose. 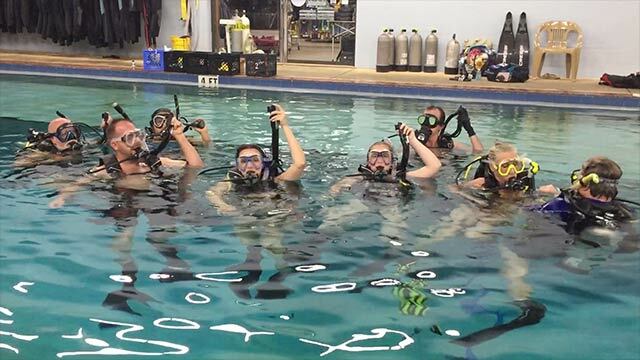 This course is led by NAUI-certified instructors, with most of the instruction taking place in our indoor, heated swimming pool. Generally there are two “checkout dives” in open water. You can choose a course schedule of two nights a week (Mon/Wed or Tue/Thu) from 6-9:30 pm OR five consecutive Saturdays from noon-5 pm. This course consists of education and training in our classroom and in our heated indoor pool. Class size is limited to eight people to ensure you receive the best education and training. Bill Jackson’s includes the use of new, up-to-date dive equipment, including weights and wetsuits when needed. You must purchase your classroom materials, and provide your own mask, snorkel, boots, fins, bathing suit and towel. Upon successful completion of this course, you will receive certification from the National Association of Underwater Instructors (NAUI), one of the top agencies in the world. During your course, practice times will be available during store hours at no extra charge. A $100 deposit will hold your spot, and the balance is due the first night of class. Open-water dive fees are additional and vary depending on location. Our course is not the shortest or the cheapest … just the best, most comprehensive scuba training in the area. Call 727-576-4169 to reserve your spot.